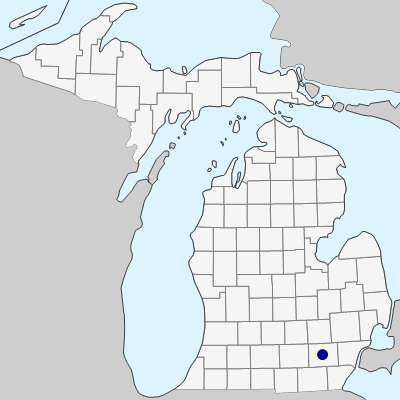 Known in Michigan only from an open swampy woods near the shore of Third Sister Lake in Washtenaw Co., the type locality. Recently discovered in Norfolk Co., in southern Ontario. This is a cryptic entity closely resembling young trees of B. alleghaniensis, and it may be that it is overlooked in open swamps and bog, fen, and lake margins, so definitely to be searched for elsewhere. This is a fertile octoploid derived from a backcross of B. ×purpusii with B. alleghaniensis. It is a small tree, so far as known up to ca. 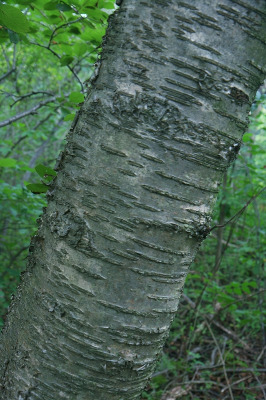 15 m tall and 20 cm in diameter, with tight, shiny reddish to grayish bark. Some individuals of the relatively widespread sterile primary hybrid, B. ×purpusii, may run here in the key, but can be distinguished by their smaller leaves, the largest only ca. 4–6 (–7.3) cm long and 3.5–5.5 cm wide, with mostly 7–9 pairs of veins. Betula murrayana has the largest leaves ca. (5.5–) 6–10 cm long, 4–7 cm wide, with (7–) 8–11 pairs of veins. See Barnes & Dancik (1985) for more information. Only one individual of the original population remains at the type locality, though seedlings have been planted nearby. MICHIGAN FLORA ONLINE. A. A. Reznicek, E. G. Voss, & B. S. Walters. February 2011. University of Michigan. Web. April 20, 2019. https://michiganflora.net/species.aspx?id=2860.